Linda Fisher, librarian, the Government High School; Siding Whyms; Daniella Dorsett; Patricia Glinton-Meicholas, author, Lusca and Other Fantastic Tales; Deonte Charles; Teresita Forbes, vice-principal, the Government High School; Ashlyn Sands and Benet Johnson. 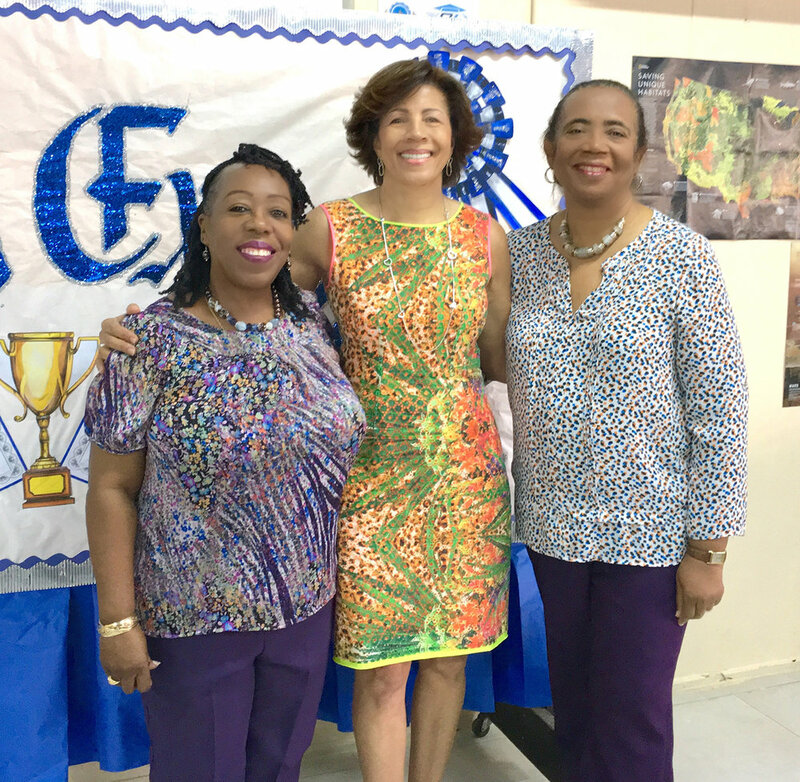 (L to r) Linda Fisher, librarian, The Government High School; Earla Bethel of DanBrad Ltd, first sponsor to the Guanima Press Ltd book-giveaway project and Patricia Glinton-Meicholas, author, Lusca and Other Fantastic Tales. In support of a book-giveaway project launched by Guanima Press Ltd, Patricia Glinton-Meicholas marked the publication of her new collection of original short stories, Lusca and Other Fantastic Tales, by gifting 600 copies to the students of her alma mater—The Government High School. Glinton-Meicholas (right) is shown with (l to r) Linda Fisher, librarian at the Government High School and Earla Bethel of DanBrad Ltd. Also a graduate of The Government High School, Bethel was the first sponsor of the Guanima Press project, which aims to put copies of the book into the hands of thousands of young Bahamians to encourage them to read more. The project has also received the support of B.T., Orry J. Sands, The Charitable Arts Foundation, The Cable Bahamas Cares Foundation, Sir Franklyn and Lady Wilson, Dawn Davies and others. “For some time now, I have had a deep concern for the widespread underperformance in educational achievement, when I know that Bahamians are brilliant. I believe that low achievement in reading and the spurning of reading widely contribute significantly to the problem. Guanima Press has always given away lots of books, but with the launch of Patricia’s new book, I decided to do it in a really big way, giving away thousands of books in the hope that it would encourage more reading” said Neko Meicholas, owner of Guanima Press Ltd, which published the new work. Recognized nationally and internationally for her writing ability and cultural knowledge, Patricia Glinton-Meicholas has created, in Lusca and Other Fantastic Tales, yet another means of preserving several of the unique, legendary, but mostly forgotten creatures of Bahamian folklore including Lusca, the Hag, and Chickcharnie. With her fertile imagination at play, she has also created a number of otherworldly characters, who demonstrate powers that are sure to have readers looking over their shoulders at unusual sounds. Lusca and Other Fantastic Tales continues what Patricia’s first book An Evening in Guanima started, the preservation of a wonderful aspect of our Bahamian heritage—its rich folklore.